Improving the experience in your outdoor space is a great way to add value to your home. But with direct sunlight being too severe at times, you may find yourself heading indoors when noon rolls around. If you’re reading this post, chances are that you’re already looking for solutions. A retractable awning seems the ideal option…doesn’t it? 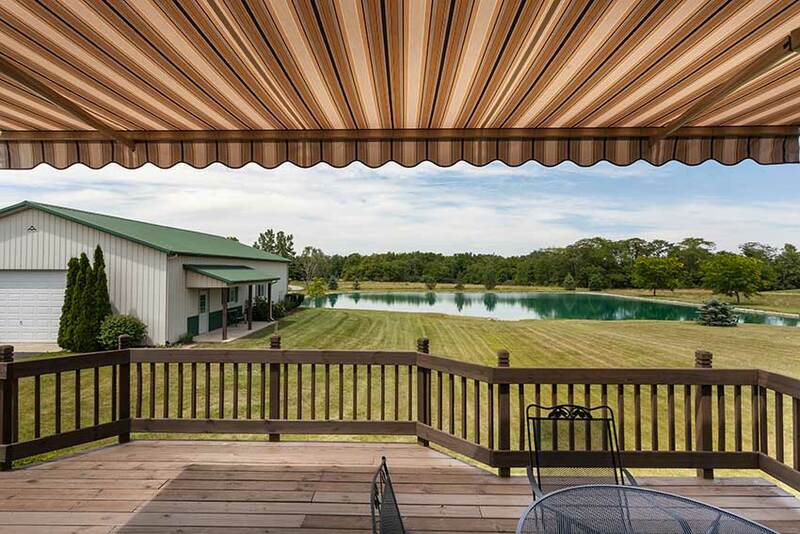 Read on to learn 5 things to consider before you buy a retractable awning. 1. Where Will the Retractable Awning Go? Most people install awnings over doors or decks. But where it’s going to be installed affects how it will be mounted. Awnings can attach to walls, either above the gutter or below the soffit, to the soffits themselves, or to roofs. It’s important to know where it will go because that affects how steep its slope will be. Where the awning will go will also affect the size of awning you need. You don’t want one that’s too narrow or it will ruin the sun-shade qualities of the awning. One-size-fits-all awnings may not suit the available space. So pick an awning in a size that fits your home. 2. Do You Want Flexibility in How You Enjoy Sunshine? If you’re lucky enough to have a patio that gets direct sunlight, you know that it’s sometimes difficult to enjoy. A patio cover is one way to give you some much-needed shade. These permanent covers don’t rot and they ensure shelter all-year-round. But an awning gives you more flexibility in the space. Simply retract it when you want to enjoy the sunshine and extend it when you want to escape into the shade. Do you have electricity on your deck? Or are power supplies otherwise a problem? Then choose a manual awning. Manual awnings go up and down with a crank. If you’d prefer convenience, or your health is a factor, choose a motorized awning that extends or retracts at the push of a button. Some motorized awnings even come with a smartphone app for extra ease of use and you never have to remember what you did with the remote! 4. Which Colors Will You Go For? Awnings can turn your outdoor space into an extension of your living space. So it’s refreshing to have over 150 styles of fabric to choose from. Match your awning to the decor in the neighboring room. Or match the color to the exterior of your house for a more minimal appearance. Use your awning to follow patio decor trends and perk up the space. 5. What’s Your Weather Generally Like? If you live in an area that’s typically windy or rainy, an awning may not be the right choice for you. While awnings can keep you sheltered if it’s drizzling, they need time to dry out before you retract them and they must have at least a 3/12 pitch to keep water from pooling. And you shouldn’t leave them out in high winds. But in milder climates, as we have in Indiana, or especially hot ones, a retractable awning is an ideal way to enjoy your outdoor space. Will You Invest in a Retractable Awning? Now that you know what to consider, you’ll be able to decide if a retractable awning is right for you. They’re a great way to make the most of your outdoor space and let you enjoy your patio or deck. If you’ve decided you want an awning, get in touch today!